Schaut man auf eine Karte von Kanada, findet man British Columbia ganz weit links – als westlichst gelegene Provinz Kanadas befindet sie sich zwischen dem Pazifik und der Gebirgslandschaft der Rocky Mountains. Zirka 5 Millionen Menschen nennen British Columbia ihr Zuhause, was es zur drittgrößten Provinz Kanadas macht. British Columbia bietet eine landschaftliche Vielfalt, die in Kanada so nur einmal existiert. Von Fjorden über Regenwälder und Winzereien bis hin zu Stränden und Bergen, kann British Columbia alle Urlaubsvorlieben erfüllen. 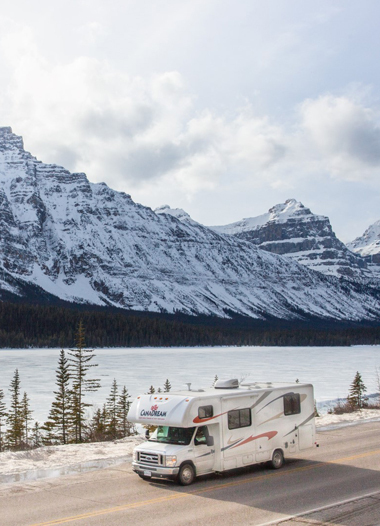 Packing it all in to one vacation however can present some planning challenges – that’s why you should rent an RV and have your accommodation and transport rolled into one neat package. CanaDream has a convenient RV pick up location in Delta, not far from the Vancouver International Airport. We can also offer suggestions for hotels, campgrounds and things to do while on your British Columbia vacation. Bei diesem einmaligen Angebot kommen unsere spezialangefertigten, winterfesten Wohnmobile zum Einsatz, in denen Sie auch bei Minusgraden alle Einrichtungen nutzen können. Kein Umbau notwendig, um das Fahrzeug sommer- und wintertauglich zu machen! Und unsere niedrigen Mietpreise machen die Flucht vor dem Winter obendrein erschwinglich. Latest pick-up date for this special is 4 April 2020. Latest drop-off date is 30 April 2020. + taxes for up to 30 nights. Latest pick-up date for this special is 3 April 2021. Latest drop-off date is 30 April 2021. The perks of vacationing in an RV become apparent in the Toronto area. Spend the day in or around the city enjoying the many food, music and cultural festivals the city holds every summer, before taking a short drive to one of the many provincial or national parks in the area to set up camp for the night away from the hustle and bustle. Latest drop-off date is 31 August 2019. + taxes for up to 7 nights. Jump in your RV and drive the Cabot Trail in breathtaking Nova Scotia. the Cabot Trail is one of the most scenic drives in Canada. Take your time and venture from the main road to find hidden fishing villages and numerous hiking trails. Move on to Canada's smallest province and take in the North Shore of Prince Edward Island. P.E.I's National Park is home to many species of birds and a nesting habitat for the endangered piping plover. Experience North America's most easterly city with a stop in St.Johns, Newfoundland. St. Johns is home to the Signal Hill National Historic Site and is a launching point for many scenic coastal hikes! Latest drop-off date is 24 May 2019. Your RV will be the perfect place to recharge your battery and create new memories. Latest pick-up date for this special is 11 July 2019. Latest drop-off date is 16 July 2019. + taxes for up to 5 nights. Departing from Calgary or Edmonton, you can expect to reach the base of the Rockies in no time at all - where endless opportunities for adventure await. Whether you prefer to fish on a peaceful lake or take an exhilarating white water rafting excursion - the Rocky Mountains have an activity for you. Latest drop-off date is 31 May 2019. The perks of vacationing in an RV become apparent in the Toronto area. Spend the day in or around the city enjoying the many food, music and cultural festivals the city holds every summer. Latest drop-off date is 15 August 2019. + taxes for up to 10 nights. + taxes for up to 21 nights. Calgary, Edmonton, Halifax, Montreal, Toronto and Vancouver offer opportunites for an unforgettable Fall adventure. Latest drop-off date is November 02, 2019. Niagara Falls is one of Canada's most popular destinations and hosts millions of visitors each year. Take some time to explore The Falls host numerous attractions like the Sky Wheel, Botanical Gardens, or for the more adventurous a trip out on Jet boat. Algonquin Provincial Park can be found just North of Toronto. The park boasts lots of activities for an outdoor adventure like Hiking through the hills and ridges or canoeing on one of the many lakes. A visit to Algonquin is sure to please all nature enthusiasts. + taxes for at least 5 nights.